Learn how to import requirements into iRise from an Excel spreadsheet, and how to update your project schema in the process. In this quick video, you'll learn how to import requirements into iRise from an Excel spreadsheet. You'll also learn how to update your project schema in the process. 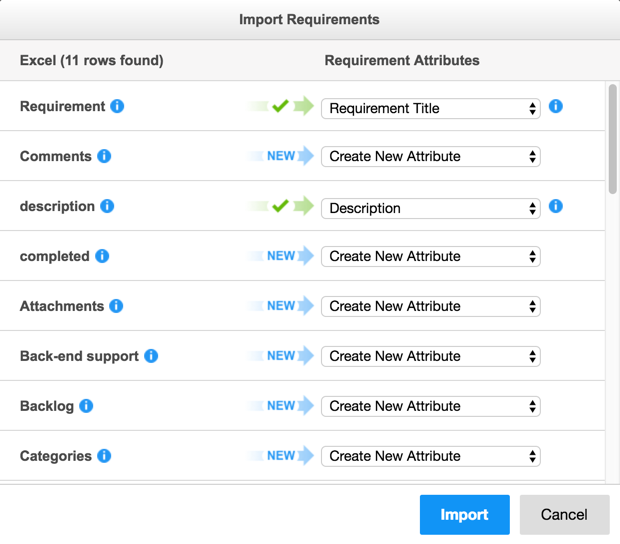 Once you log into the Definition Center, find the existing project you wish to import requirements into. Hover over the thumbnail for that project, and select the 'Manage Project' icon. Once in Manager, go to the gear icon on the top right, and select 'Import Requirements'. Your import file should contain at least a project title & description. The import function will only read the first worksheet. If you have multiple worksheets, move the one with the requirements to the first position. Note: If you still get an error, make sure you don’t have any hidden worksheets. The column names need to be in the first row. Remove any extra rows to ensure that the column names appear in the first row. In order to bring over all the columns, the cells in the first row can not be blank. If blank, put in an “x’ for the import. Once the data has been imported, you can then edit the schema and remove the “x” where appropriate. When you start to import the file, you'll see a mapping list similar to below. The import will try to match existing attributes with columns in the excel spreadsheet.